Gearstar transmissions are all custom. Building each transmission with to the specific needs of the customer is important to Gearstar. We’re looking to maintain a standard of excellence in the industry. 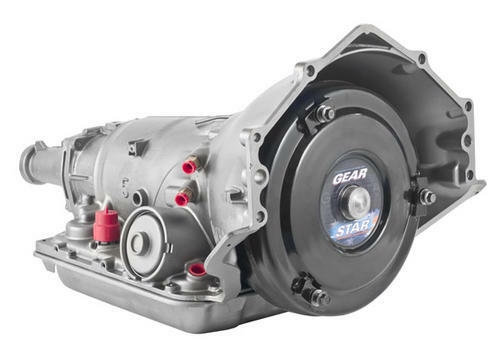 Rated for up to 450 hp and 425 lb-ft of torque makes the Gearstar 4L60E level Two transmission a perfect match for the Truck Trend application. Read full specs for the Gearstar 4L60E Level Two Here. There are many mechanical sounds that have a certain way of crawling right into your head thus releasing thoughts of dread and dismay. Those kinds of sounds consequently signify that your day, week, or possibly month is in complete ruin. There seems to be a direct correlation between the emanating sounds and your wallet. It’s like they’re somehow connected to each other therefore causing your credit cards and hundred dollar bills to shake uncontrollably. We felt that when our ’02 Chevy Avalanche began to show signs of finally calling it quits. Trying to get moving from a stop was an exercise in frustration as the engine would rev while the transmission wouldn’t allow much forward momentum. After a week of slipping, the 4L60E had enough of our abuse and as a result decided to leave the SUT stranded awaiting a tow truck to come to the rescue. A 2002 Chevy Avalanche, equipped with a new LS327 GMPP crate engine, receives a Gearstar Level Two 4L60E Transmission, installed at The Transmission House, in Truckin’ Magazine!